Are you a blogger that writes about Tarot? If so, do you want to get involved in a community of Tarot bloggers? If the answer is yes, then now is a good time to join the Tarot Blog Hop community on Facebook. Eight times a year (about every six weeks), the members of the Tarot Blog Hop community get together and do a common theme blog chain. The theme for the next Tarot Blog Hop (June 21, 2016), which is being wrangled by me, is Junk Mail Tarot, a "Tarot art project for non-artists." The idea is to take some photos and/or artwork that someone else has done, and turn it into a Tarot card. Yes, I am assuming that you get junk mail and/or magazines. If not, there is plenty of random photos on the internet, including stock photo sites. And then, there are the meme making sites. 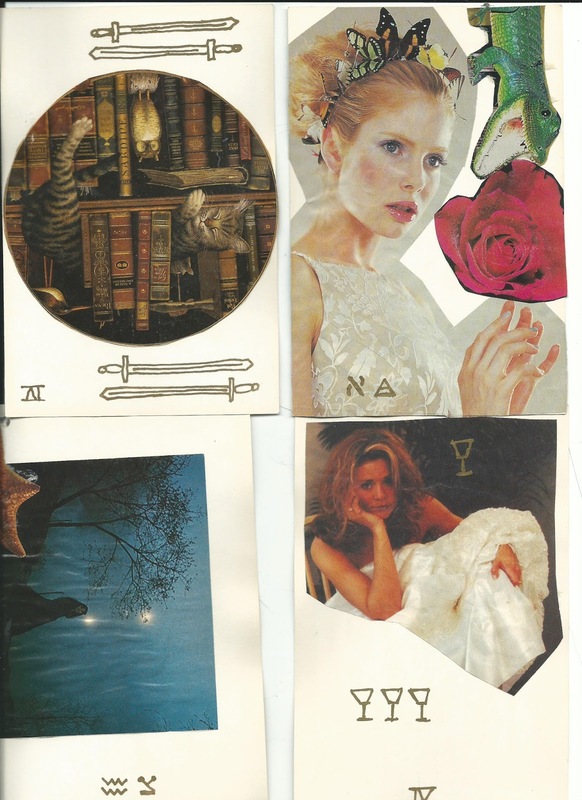 Examples of Junk Mail Tarot. Created using index cards, some photos from magazines, and a pen. 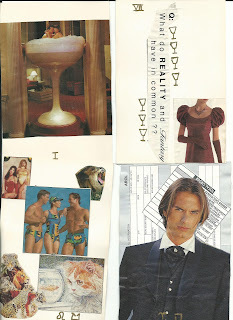 More examples of Junk Mail Tarot. These could have been Junk Mail Tarot. 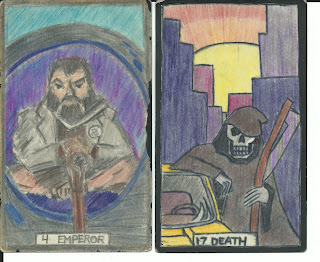 While this looks like actual artwork, bear in mind that these two cards are actually based on a scene from an old TV show, and a urban fantasy book cover. I could have just as easily did them with screenshots or photocopies. Now for the writing part...because search engines love indexing text and words and stuff like that. For the writing part, talk about why you choose the images, and how you are associating them to a particular Tarot card. Bloggers must take part in two hops per year. Bloggers must post their posts at the same time. Yes, some people end up posting at 2 am---after all, it is an international blog chain. Bloggers must link to their neighbors in the chain, as well as the Master List. Bloggers must comment on five other blogs. And the coordination of this blog chain happens on Facebook.